The Flying Knife sails through the air without turning! Of course, this is due to its special construction and throwing technique, not some magic spell like every knifethrower sometimes wishes to know. Paco Tovar, an engineer from Spain, did not want to accept the annoying fact that throwing knives often hit the target handle first and don`t stick. Hence, he went on to develop the Flying Knife, which behaves like a little spear. The hole in the handle is for the index finger on which all the weight comes to rest. The finger lets the knife slip off in the right moment, through the friction imparting a spin round the longitudinal axis of the knife. This spin stabilizes the flight, quite like with bullets. The knife is thrown about the same way like you would throw a ball. Instructions are included with every knife. At the 2nd Big Throwers Meeting at the LBHR, Paco presented his knife for the first time outside of Spain. Later that year Paco won the long distance competition of the Central US Knife Throwing Championship in Austin. He stuck it in the bull`s eye from a distance of 18.10 m ! On both occations, the knife been tested thoroughly by the knife throwers and spectators present. It turned out that even people that do not have much experience in throwing knives do very well. Women also have good success with their natural throwing movement, the knife often stuck at the first throw! Experienced throwers will quickly learn the new throwing style. The Flying Knife can also be thrown like a traditional throwing knife. The knife is quite robust. The blade (16cm) is manufactured from 440 steel, the grip is Zytel (Nylon), its rubbery surface providing a good hold. The sheath is a real beauty and well made. The knife has a total length of 32cm and weight of 215g. 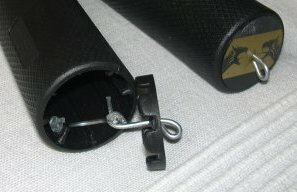 In the current model, the endcap has received a metal-hook-and-rubber retaining construction. Thus, if fancy strikes you, the handle can be filled with survival gear, or even the whole Flying Knife mounted on a stick to double as spear. Paco has patented his invention in different countries and sells it worldwide. The throwing knife will be most popular with people who just start throwing and don`t want to take care of spins, as well with advanced throwers who want to master an alternative throwing technique. Please be aware that, as with the Easy-Stik Pro, the specific throwing style can not be used with other knives.